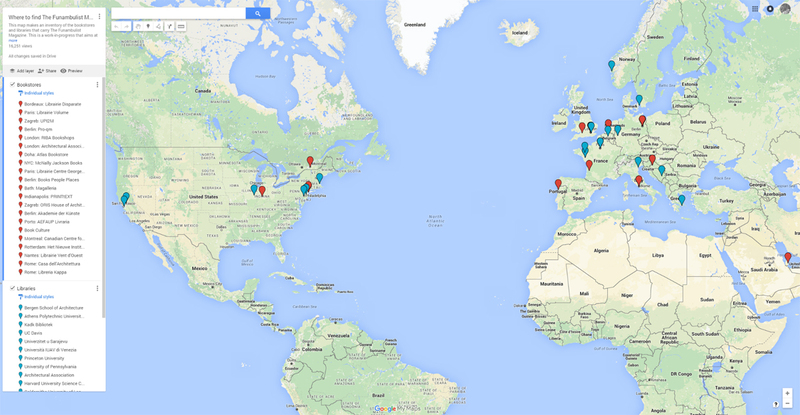 The 127 guests (friends) of Archipelago, The Funambulist’s podcast since January 2014. 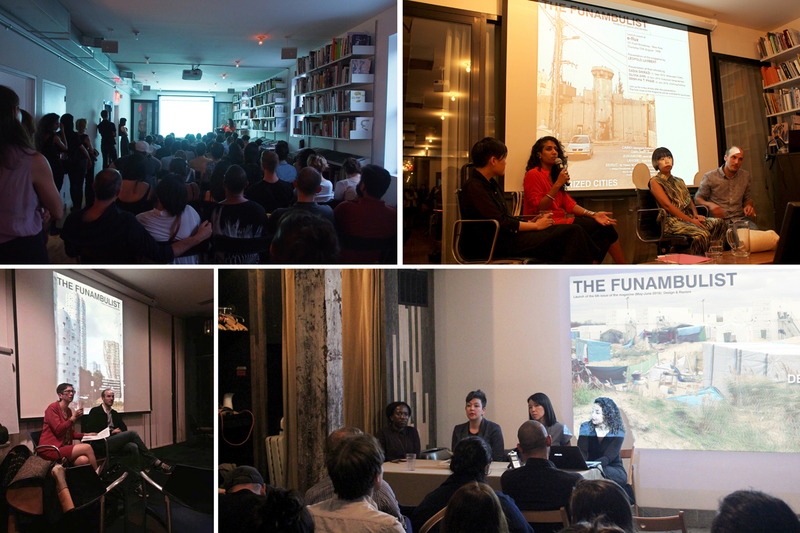 On July 2nd, I was lucky enough to be able to be part of the Athens conference Autonoma, presenting my half of a talk elaborated with friends of dpr-barcelona, Ethel Baraona Pohl and César Reyes Nájera, entitled “Political Friendships.” Through it, we intended to address the politics of form rather than contents, as we usually do in our talks. By addressing the “form,” we meant to discuss about the “behind the scenes” part of our editorial work in order to put on the table as many political elements that usually remain undiscussed because they do not explicitly materialize in the final aspect of this work. Every day, we have to take or confirm a certain amount of decisions that have important political consequences but that rarely get addressed as part of a larger debate. This text is a synthesis of the talk I gave in this context, hoping that the conversation engaged in Athens could continue here, online. With the sixth issue of the magazine now published, thus concluding the first year of existence of the publication, this also allows me to pin point a few problems that need to be addressed in the coming months, as well as to give a more personal (i.e. more fallible) account of this work. 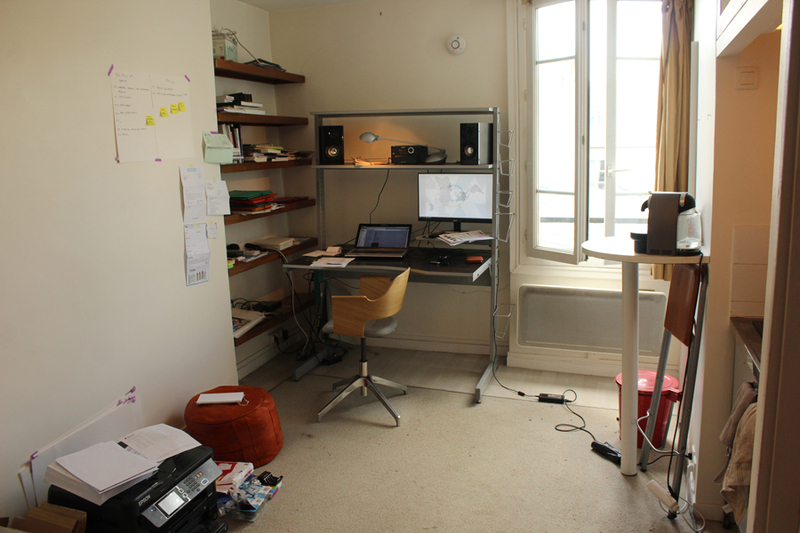 Let’s start with my office in Paris. This is where I work 7 days a week when I’m not travelling. I ought to make it more equipped to host meetings with the occasional visitors and collaborators! 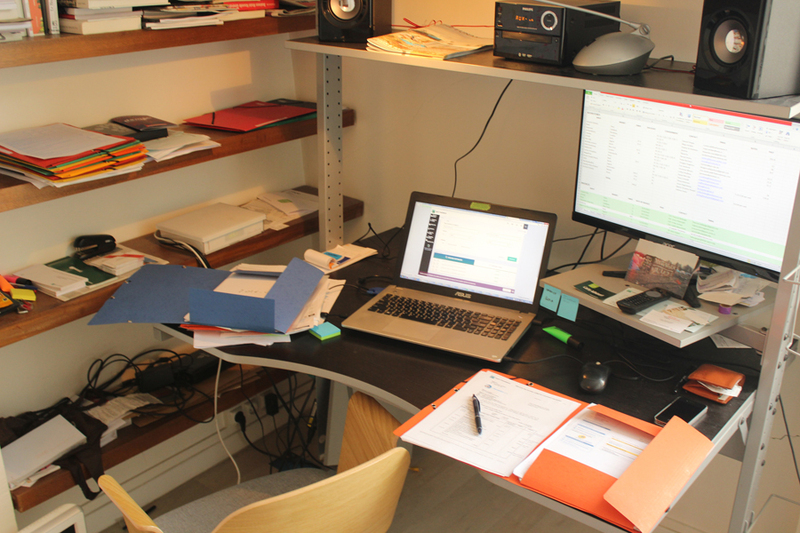 Of course, an editorial project requires a lot of work on the computer: exchanging emails with contributors, editing the drafts received, finding authorized illustrations, designing the layout of the magazine, and formatting texts within it, etc. The tone of the articles is important in relation to the audience with which the project wants to engage. In this case, a strong emphasis is put on the idea that a non-academic, not necessarily English-native reader audience — such a profile includes myself to a certain extent — should be able to understand every text: jargon and footnotes are prohibited. This is not to say that every idea can be explained through a simple language but, rather, that the arguments curated in the publication cannot claim to be politically engaging if they require an academic background to understand them. 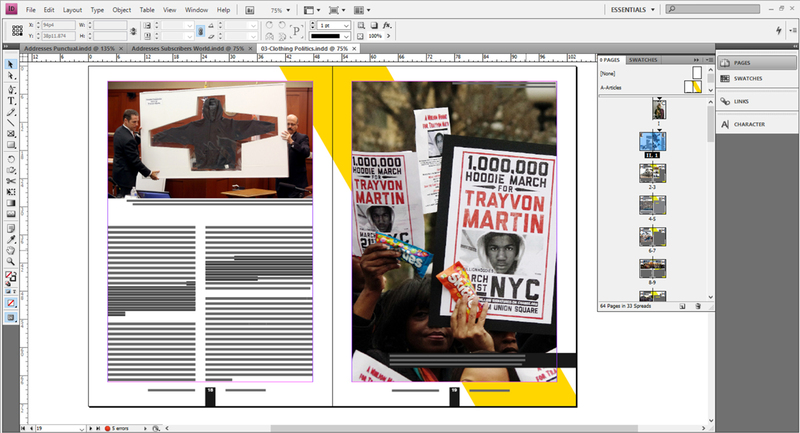 Publishing a printed magazine means that there is a also an object logistic behind it. 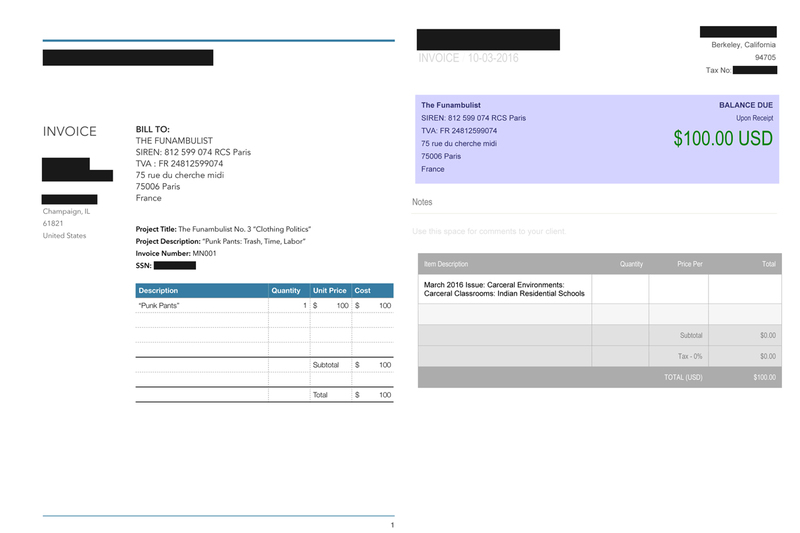 Every other month, I send a file to be printed near Lyon and hope for the best when receiving several hundreds copies a few days later (offset printing does not allow any testing). A first element of self-critique concerns the politics of printing which, beyond the patronizing of a small local business, remains non-engaged when it comes to the paper and ink manufacturing for instance. Once received, a few hundreds copies are to be immediately placed into envelopes, carried to the affiliated post office (usually in two large suitcases) and shipped to the subscribers and bookstores that, hopefully, will receive them a few days later. In this regard, it is interesting to see which national postal service are the most efficient and what it reveals about the concerned country’s value of public service. USPS in the United States, for instance, seems to have given up their profession to private services. Money. The taboo of too many anti-capitalist conversations (including this conference). It seems however very important to tackle it in order to act on its consequential politics. Every month, I have to spend about a full day of accounting, and subsequent budgeting for the coming month. The tracking of bills to pay (healthcare, internet, rent, etc.) and to receive is also an important part of this day. Although this might appear facetious, this exercise is crucial to the survival of the project and, as such, the time and energy spent on it feels engaging and the end of these days always leave me with a sense of accomplishment. Through this overview of the economic dimension of the publication, I also get a synthesis of the various elements involving money that have strong political incidences. Price is, of course, a very important element and this is where a second strong point of self-critique intervenes. Having until then systematically placed everything I produced under a creative commons license (to the exception of the book Weaponized Architecture published by dpr-barcelona in 2012) and despite the continuation of The Funambulist’s open access blog and podcast, I started this new project with a deep sense of discomfort when I had to begin monetizing the production of my contributors’ and my labor. Instead of using this discomfort to find ethically viable of doing so, I went on without considering enough options. As a result, the prices of the magazine (12 euros for the printed version, 6 euros for the digital one) are prohibitive to a very large audience even if subscriptions allow a somewhat cheaper access to it. Despite the fact that the subjects tackled by the publication operate at a worldwide scale (see map below), the large majority of people who purchase the magazine live in Western Europe and North America. The map above shows the bookstores and libraries in which the magazine can be found, betraying such a geographical reprehensible tendency — not to mention the social differences within countries themselves. One important aspect of my work for the second year of the publication will therefore consists in challenging this problem. Bookstores in Portugal, Croatia and Greece already proposes the magazine for a much cheaper price, but these punctual initiatives will need to be systematized everywhere in Southern Europe and in the Global South (i.e. the largest part of the world!). This aspect of the project can only function if readers who have the means to purchase the magazine through its full price also understand their responsibility to support a project so that others can also benefit with it. This economic and ethical balance is a complex one and I welcome inputs on how it can be achieved. 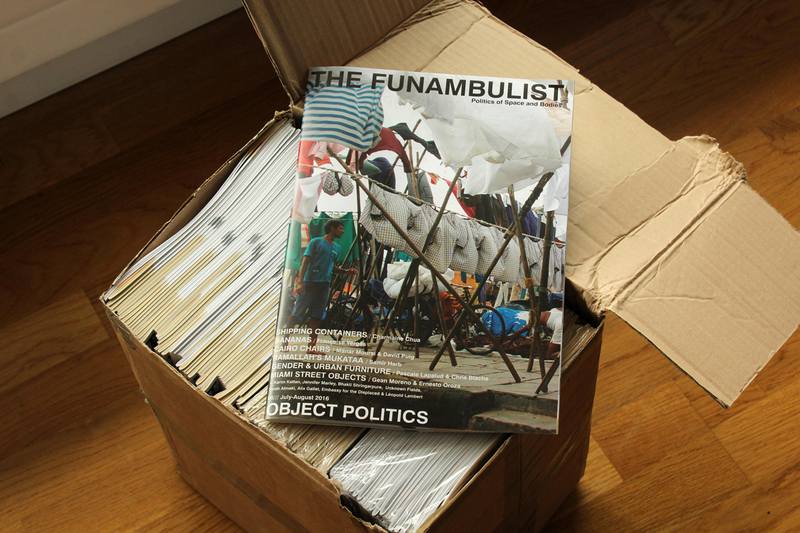 I am the only person working continuously on The Funambulist. Like many small companies, my budget does not allow me to have any employees. Many architecture offices in this position decide to rely on the numerous people who send them internship applications and who will receive either a very low salary or no salary at all. Receiving quite a few myself, I know that the sole “valuable experience” of the check above (!) is something that sometimes come from potential interns themselves and, it becomes therefore tempting for anyone to capitalize on this self-alienation. Having been an unpaid intern myself less than a decade ago, I know that some unpaid internships are indeed sometimes more valuable than uninteresting paid ones. However, the luxury of being able not to be paid reinforces the social split to the disfavor of those who simply cannot. Furthermore, it reinforces a culture in which unpaid labor becomes a norm. For these reasons, I declined and will continue to decline all internship application until I will be able to properly pay interns with “valuable experience” and money. The same thing goes for contributors who produce a significant labor in order to come out with the wonderful articles of the publication. Although, a certain amount of them has a somehow stable salary in the context of academia, publishing specifically curated articles in a magazine that attemptively pays my own salary is nothing short of exploitation. Although I do apply this logic and pay my contributor, I also have to say that there is nothing satisfactory in the way I currently do so ($100 for main articles, $50 for guest columns and use of photographs) as their honorarium should be three to four times more (there will be a 50% increase starting the 8th issue) given the labor they mobilize for it — the same goes for copy/proof editors or other occasional collaborators. As such, I don’t want to appear in any way as “giving lessons,” but rather as trying to account for the negotiation between an important ethical position and economic contingencies. Finally, there is the form of the editorial line itself. This consists in considering the publication as a speakerphone and addressing what is being said in it by whom. Although I do not think that every magazine’s editorial line should necessarily mobilize a scale as large as the entire world to be considered as valuing minor narratives, it becomes an important thing to monitor if the publication’s articles are describing various geographical situations. 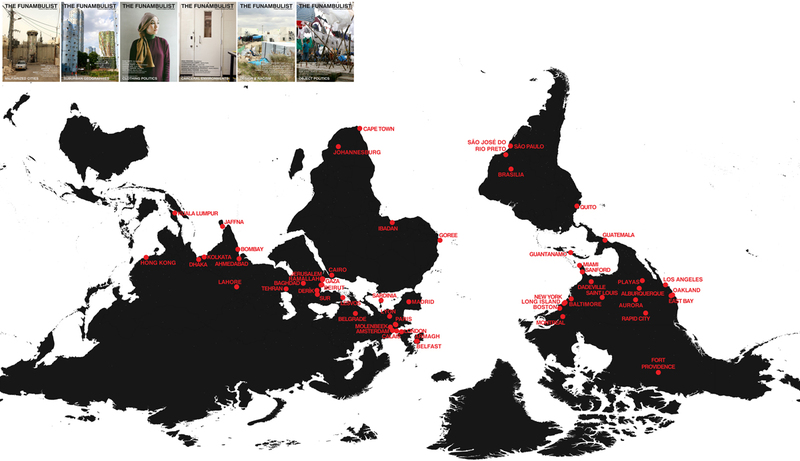 In the case of The Funambulist Magazine, the map above shows the world locations that have been mobilized one or a few times in the six first issues. To me, this map is equally satisfactory in the large range of locations, and insufficient in the way it does not yet involve enough accounts from places that get usually excluded from the global narrative. The notion of political friendships intervenes particularly when it comes to the question of who is speaking in the speakerphone that constitutes this project. Concentrating myself as the editor of the publication, the quasi-totality of the globalized normative body (white, cisgender-looking male, able, owner of a passport from a country that acquired an important part of its wealth from the participation, elaboration and enforcement of slavery and colonialism), it is my role to curate issues that silences the perspective of this position in order to provide a humble platform to anti-racist, feminist, queer, exiled voices without ever essentializing them as such. In a world where simply accepting to shut up would still be a position in compliance with the normative order, this is the only tenable position if we want to contribute destroying the latter. It requires a continuous questioning of our personal social position in relation to others. The decolonization of our own discourses is never fully achieved and automatic behaviors learned and performed through privileges often re-emerge, but this is where friendship becomes a revolutionary thing (much more than the notion of alliance, I believe), as it involves simultaneously mutual trust and kindness, two notions that do not immediately appear as political but should urgently replace those of “tolerance” and “inclusiveness” in the dominant liberal discourse. As readers might be able to tell that things are getting more and more personal, I would like to conclude this text with a last aspect addressed in the talk: emotional labor. Once again, such a labor is always proportional to one’s position in relation to the structural norm: the amount of sexist and/or racist micro-aggression (or much more explicit ones, of course) that one may experience for instance on a daily basis necessarily adds a drastic weight on any other emotional labor engaged in their work. This is nonetheless a part of work with which every one engaged in the construction of minor narratives have to deal, and it remains usually undiscussed, perhaps in a perpetuated patriarchal suspicion towards emotions. Manifestations of friendship through encouragement or any other forms of support (through emails, social media, or incarnated encounters) are what allow to counter the (unequal) toll that emotional labor takes on our persons. It is less a need for validation than the feeling to humbly belong to a larger political community. This labor is also mobilized in the emotional position we choose to adopt personally and in our work. The one I am personally trying to hold — I am full of doubts about whether this is the right one and if this comes from a dubious position of privilege — is one of emotional optimism. This is not a position that denies the profound legitimate anger that is ours when witnessing the violence of the forces against which we struggle, this is not either a position of hope or progress that would candidly foresee a more agreeable future, but rather, this is a position in which we make ourselves continuously engaged in the productivity/constructivism of our struggles. This means that we may never win, but that we are definitely winning.